Superb 90cm gregorian style dish, can hold up to sixteen LNB's on one crossarm. The wave frontier 90cm dish allows you to mount up to five LNB's up to 40 degrees apart. Test results from this dish have been amazing. No more waiting for your dish to move. 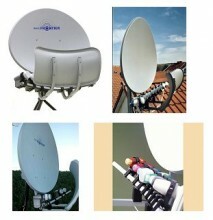 You can now have instant switching between all selected satellites. Supplied with four adjustable LNB holders as standard. Can wall or ground mounted. Click the button below to add the Wave Frontier 90CM Toroidal Dish to your wish list.